I am finally coming up for air after a very difficult summer and fall. One thing I started doing this year is walking with friends. A couple of friends had challenges at work to see who got the most steps. Weekly now I have walked with many friends before school during the week, early in the morning on the weekends and even at soccer games. The walking and talking has deepened my friendships and made this year so much easier to manage. We frequently walk the paths by my house that have creeks. Lately we have seen a blue heron on our walks. This week I felt like it was posing and we were able to get close enough to take a picture. I love that I have such peace and tranquility that is near me. I have had faith in my journey this year and try to take it one step at a time. Have a great week. I am jumping back in this week. It has been a flurry of activity in my life and I have spent very little time in the studio or even at my computer. this beautiful life I get to live. I am spending a couple of days in the country and hope I will get some great pics to post. I am writing and scheduling this post ahead of time so I just need to add my pictures on my return on Friday and hope to get back on schedule of taking and posting pics and visiting the weeks I have missed. Thanks for all the encouragement and comments, they warm my heart and make me smile more than you can imagine. I hope everyone's summer is off to a good start. I hope to be engaged with my blog and studio once more and plan on getting my boys to help me organize my studio space. I think winter will never end, but I know Spring is around the corner. The weeks keep flying by and I am trying to take one day at a time. It is hard not to get caught up in the little things left undone, but I am trying to focus on the big picture. I had an enjoyable field trip to Jamestown, Virginia with my youngest. I planned on packing my big camera, but it was going to be a cold and rainy day. I am posting 2 pictures, one by my young photographer of the Powhatan Indian huts called yehakins and one of the re-created boats of Jamestown and the shore. It was a great day and we look forward to going again in nicer weather. I will be enjoying a great weekend of soccer. My oldest is back playing after a serious injury last year and I am so grateful for his recovery and the joy of watching him play. I hope Spring is here soon and don't forget to spring your clocks forward tonight! Thanks to Sally and all the participants you are all so inspiring. I am trying to play catch up although I skipped the collage week 7 I hope to add that some time along the way. I really try to capture a picture of something I did during the week. I picked up more paint to create some paintings, I am sure some paintings will show up in the coming weeks. March, I love the theme of stepping out. I am trying to get out and connect. This week I went to 1Millioncups in Loudoun to see a presentation and connect with other entrepreneurs. I also went to an open studio hosted by Mary Kearns of Herban Lifestyle. I purchased some incredible lip balm and a solid hand lotion in a tin, brilliant innovation and the smell is just amazing. I am finding more and more that connecting with other creatives and entrepreneurs inspiring. I love their energy and creativity and they give me ideas that I may not have considered. If any of you are local, I am always looking for creative play dates or field trips. Thanks for stopping by, I am really ready for spring and I hope she shows up by the end of the month. This is my second year participating in Focus on Life...thank you Sally and all the participants I am stretching myself in so many ways. I took my first paining class last night and it was definitely a quiet calm moment as it started to come together and I got in to refining my painting. It was just what I needed to add something different to my creative routine. Have a wonderful week and I hope something brought you quiet calm this week. In an effort to make 2014 a more productive year...I am choosing the word finish. I used to be great about picking a few things that had to be finished each day and finished them. Usually, when I pick 3 things to accomplish I continue to do more. In 2013 , I got derailed more than normal and felt like I was lucky to do the bare minimum. I know the one thing that helps me accomplish my goals is consistent exercise, it clears my head and gives me energy to tackle what ever my day has ahead. I just read a quote similar to this in a magazine...I never regret exercising, I only regret when I skip a work out. This is so true for me, so heres to finishing a work out and my goals for the day. Just for fun my picture is snapped from a French verb dictionary. What helps you stay on track, please share. Thanks for coming by and have a great week. I have really enjoyed Focus on Life this year. I was contemplating the last prompt, and was so excited to see Sally offering Focus on Life for 2014. Sign up today for the early bird pricing. I am not saying goodbye...but I am saying hello to what is next on the horizon. Thank you from the bottom of my heart to Sally and all the participants for inspiring me this year and I look forward to continuing the journey next year. I would love suggestions on how to be more efficient visiting blogs...so send me your hints. Warm Wishes to you and yours for a Healthy and Happy New Year and to what is next on the horizon. My favorite time to spend with anyone is over the making or eating of food. I can not believe Sally has lead us through this entire year. I know food photos do not always look great, so I waited until I made a batch of red velvet cookies with rolos in the center. I follow the recipe from Duncan Hines for red velvet crinkle cookies and substitute vanilla for the lemon zest and form the dough around a rolo for a chewy surprise. May you and yours enjoy this Holiday Season and Blessings for Christmas and Peace and Joy New Year! Please check out Focus on Life for next year at Sally's blog, The Studio Sublime, I am already signed up and Sally has special pricing through 12/28. Focus on Life has been a weekly photo prompt challenge by Sally Russick of the Studio Sublime. I have had trouble keeping up this fall, but I am trying to catch up this weekend. I finally re-stocked the ArtSpace Gallery gift shop in the town of Herndon, Virginia. The ladies were great at giving me feedback and I sold a couple of items at drop off...happy dance!!! A couple of new enamel pendants, I am really happy with the way they came out. I feel like I have been in the shadows as far as creating jewelry. I was thrilled to read Kris Lanae Binfelds blog showing her bead soup winning design in the fall issue of Jewelry Affaire magazine, which includes all the bead Soup Winners. My name is even listed as her bead soup partner, big happy dance. I was Kris's bead soup partner and sent her some of my first lamp work beads and swirl head pins as well as a focal by Barbara Bechtel of Second Surf that Kris incorporated in her gorgeous design. I also sent her a grey swirl bead by HMB Studios, that I wired wrapped that Kris used in the design. To read about this bead soup check out my post here. Thanks to Lori Anderson for connecting us and you can read all about the Bead Soup Party at Lori's blog. Thanks to all the bead and jewelry makers that inspire me each and every day, my life is so much richer for this creative community! I have a batch of swirl headpins to pick up next week at the studio to be made in to necklaces and will be making more, please leave me a comment with your email if you are interested in purchasing them and I will send you a note when I have some listed in my shop. I had a wonderful time at Bead Fest, but fell short on getting my picture done and posted before I left. I honestly did not know what I wanted to add to my picture, so today I decided to try and add something to my sunflower picture. I know I have to play more with effects, but a least I got to try the befunky tool Sally suggested. I sharpened the picture and decided on the film frame effect. Please check out all the other pictures linked below. I am enjoying this last bit of summer with my boys...school starts next week. Have a great week and I will be back on track this week and post some bead fest photos too! We started our week at Deep Creek Lake by attending the Garrett County Fair, it was so much fun riding the rides...I smiled and laughed like a kid. We also went to the demolition Derby, the boys really liked watching all the cars crash and smash. As the night was winding down I knew my picture for the week had to be of the Ferris wheel against the darkening sky. I loved standing at the fair watching all the happy faces and enjoying an evening with my family including my brother and his family. I hope you had a chance to laugh like a kid this week, it is so good for the soul. You can see all the other participants below. Have a great week and always thanks for visiting and leaving every single word...I love reading your comments. This past week I had a chance to spend some time at the Jersey Shore with my family, this was my first beach as well as my boys. We had a great time watching the surfers at Manasquan inlet and no trip would be complete without a walk on the Spring Lake boardwalk, where I snapped this photo. I love the energy and relaxed schedule of the summer time, I hope you are having a great summer!!! Check out the other awesome photos at Studio Sublime. Thank you for coming by, I am always humbled by the comments that everyone posts and grateful beyond words to Sally and all the participants for taking us all on this amazing weekly photo journey. My summer purse...it makes me happy carrying this pretty pattern around. Visit the Studio Sublime or see the links below to see all the other pretty patterns. Thanks so much for stopping by and have a great week. It was a week of waiting for surgery for my son's broken leg. I was feeling a bit anxious the night before as I drove to soccer practice (for his brother), a car passed and the license plate read BREEATHE. I was not able to snap a picture, but Breathe is my word of the year and is just the word I needed to see. As, I walked the hospital grounds the next day to get some exercise while waiting for my son to come out of surgery I snapped my photo for the week. I love the name of the road to the hospital, what a hopeful sign to see as you drive on to the grounds. Thank you all for your well wishes and prayers for a speedy recovery, I appreciate every single word. Surgery went well, now time for healing. I hope you have a fantastic week and see the typography that Sally and the rest of the participants snapped this week at the Studio Sublime. This week I hosted Bunko at my house, this is a dice game that I play with my friends and I call it a girl's version of poker night. We always put snacks on the table. I decided to put Hershey miniatures on one table. The idea was to have a variety of candy and to limit my consumption, since I had to unwrap each piece. Let's just say unwrapping did not slow me down! See what everyone else wrapped by visiting Sally at the Studio Sublime. I was one of the lucky winners of the Art Jewelry Elements component of the month. I am very excited to be participating. I received a beautiful blue enamel pendant with fine silver pebbles made by Francesca Watson. I had a couple of ideas in mind, but executing the design in your head does not always work out as planned. I got the pendant embellished with faceted ruby rondelles and a smooth apatite rondelle, but had a hard time creating a chain that would complement the component. Many links were formed and I almost resorted to putting it on a ready made chain, but I really wanted to make the chain. I finally made a simple chain with sterling balls for the beads to pick up the fine silver pebbles on the pendant and used one ruby link in the chain. I very happy with my final design. Thank you Francesca for a beautiful pendant and Art Jewelry Elements for an oppurtunity to participate and for all the inspiration that you provide. Please visit Art Jewelry Elements to see what everyone else created. First I want to say thank you to everyone for the all the beautiful comments last week and making the first week of Sally's Focus on life so special, I tried to make it to all the blogs and really enjoyed reading all of our stories. Secondly, thanks to Lori Anderson for hosting the Memories and Thanks blog hop. I decided to combine the 2 in one post as they seemed to go together. I chose the word breathe this year because it really resonated with me in yoga class one day as the instructor said breathe in peace and breathe out tension, but I found this on Pinterest and like it even better. I know when I breathe in deeply it really calms me and makes me aware of the present moment. My thanks goes to my mother that gave me my breath and who I miss especially this month as it is her birthday month. When I first started making jewelry my Mom wanted a simple pearl bracelet so I whipped one up and gave it to her. 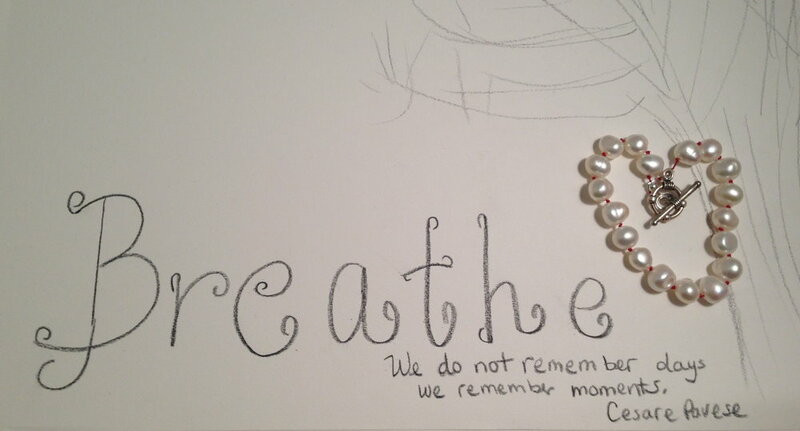 When my Mom lost her battle with lung cancer it came back to me in her jewelry box. In honor of her I decided to re-do the "Dee" bracelet" by hand knotting it in red, one of her favorite colors. I am participating in Sally Russick's Focusing on Life 52 photos. It is an exciting challenge and will help me better use the new digital camera I bought last year. Sally gives us a prompt each week and we snap a photo...so excited to get the prompt on Jan 1, but oh no a self portrait are you kidding me!!! I am not very photogenic and prefer a natural shot when I am not paying attention. So, I snapped a few photos with my phone New Year's morning, I will share one later. Next, I decided to try a few shots in a mirror and learned how to use the self timer on my camera and the pictures were not in focus. The first one one I took in front of the mirror picture I selected. It is the most natural shot and it sums up the challenge, as I will be behind my camera this year taking my 52 weeks of photos. So after dreading my first assignment I am happy with my result. Thanks Sally for challenging me and I look forward to 51 more photos. And just for fun taken with my iPhone, the runner up taken New Years morning!